Relish this rich, sweet, creamy and nutty Rabdi this festive season! Rabdi is a milk based, Indian dessert made on festivals and special, celebratory occasions in Indian homes. 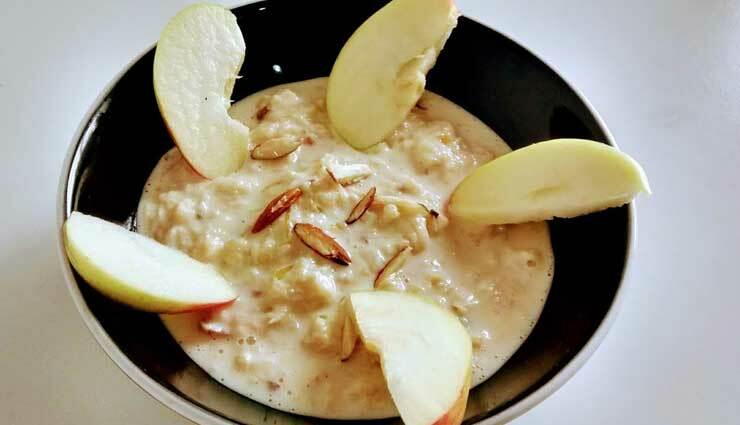 Here is a healthier version of Rabdi recipe, fillid with the goodness of apples, almonds and pistachios. * Pour milk in a broad vessel and bring to a boil. Simmer till reduced to half the original quantity. * Add sugar and cook on low heat, stirring continuously. * Peel and grate two apples. Add the grated apples to reduced milk and mix. * Cook for three to four minutes. Add cardamom powder, almonds and pistachios. * Pour into a serving dish. Thinly slice the remaining apple. Arrange the slices all around the dish. Serve hot or cold.